-First, you’ll need to select and prepare your fabric. I suggest using drapery weight or home decor fabrics. Their very thick and sturdy- which is just what you want in a reusable shopping bag, right? You’ll need about 2/3 of a yard for the bag and 1/3 of a yard for the straps. Wash your fabric before using it. Iron your fabic- my least favorite part! Now, for the cutting!!! -Cut 2 – 16″ by 12.5″ – this will be the front and back of your back. (16″ will be vertical and 12.5″ will be horizontal. -Cut 1 – 9″ by 43.5″ – this will be the sides and bottom of your bag. This part you can play with. 9″ is a perfect width for a large bag- large enough to hold 2 gallons of milk. If you want it larger- cut the width larger. If you want a smaller bag- cut the width smaller. The two bags in the photo above are two different sizes here. The one on the right is 9″ by 43.5″ and the one on the left is 6″ by 43.5″. This is where you would adjust to make the large or medium bag. 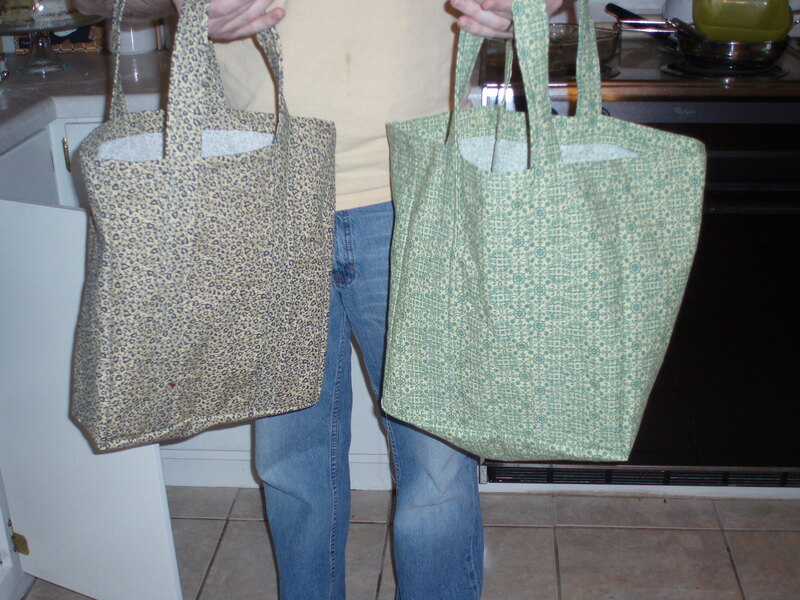 The 6″ bag is still a fairly good sized bag and would be more appropriate for canned goods, rice, flour, 2 liters, etc. 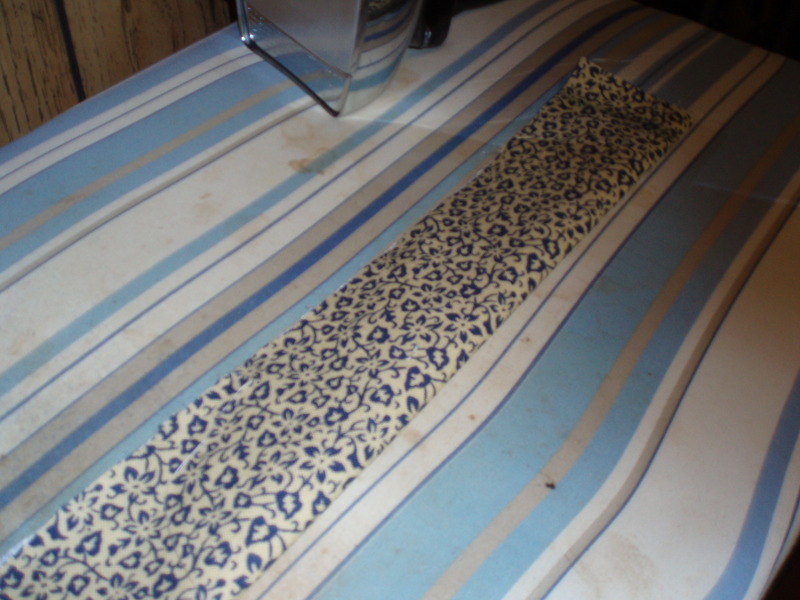 -Cut 2- 5″ by 44″- this will be the straps. You can make the straps match or contrast. – Now, we work on the straps! (And please ignore my old, stained ironing board cover. I have not got around to making a new one!) Fold each strap in half and iron. You want the material right side out (wrong sides together). -Now you are going to fold the edges of the fabric in towards the center fold and iron. Your strap is now folded one forth its original size. -Pin a strap onto the front of the bag. The straps should be 3″ from the edges of the bag. Pin to 5″ from the top of the bag- that’s as far up as you will sew initially. -Topstitch the strap onto the bag, removing your pins as you go. Sew close to the edges of the strap. Topstitch each side of the strap, stopping 5″ from the top. -Repeat pinning and sewing straps for the back piece. -Now you should have an identical front & back piece that look like this. You’ll finish your straps later. -Take the front of your bag (either piece you determine to be the “front”- it doesn’t so much matter which one you choose.) 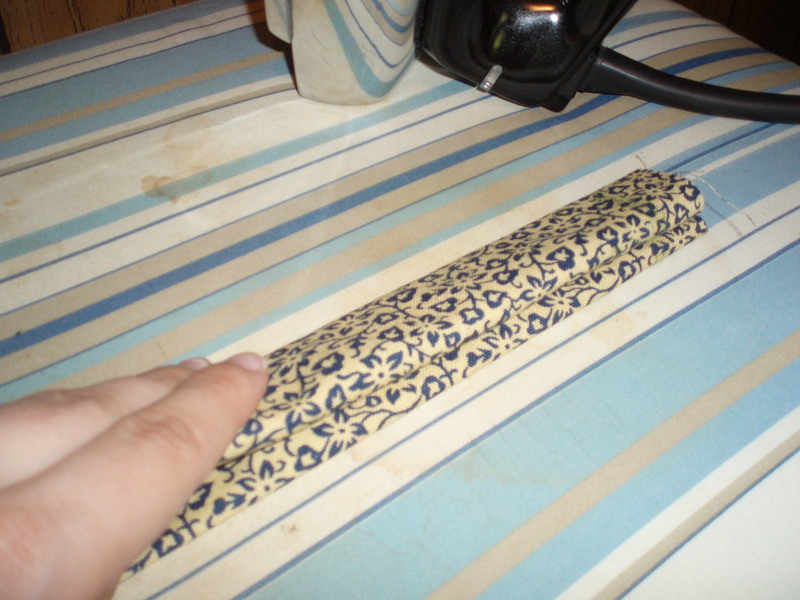 and the side/bottom strip (the 9″ by 43.5″ strip- or 6″ by 43.5″ strip- whatever width you chose to make it) and place together with right sides together – matching the top edges. 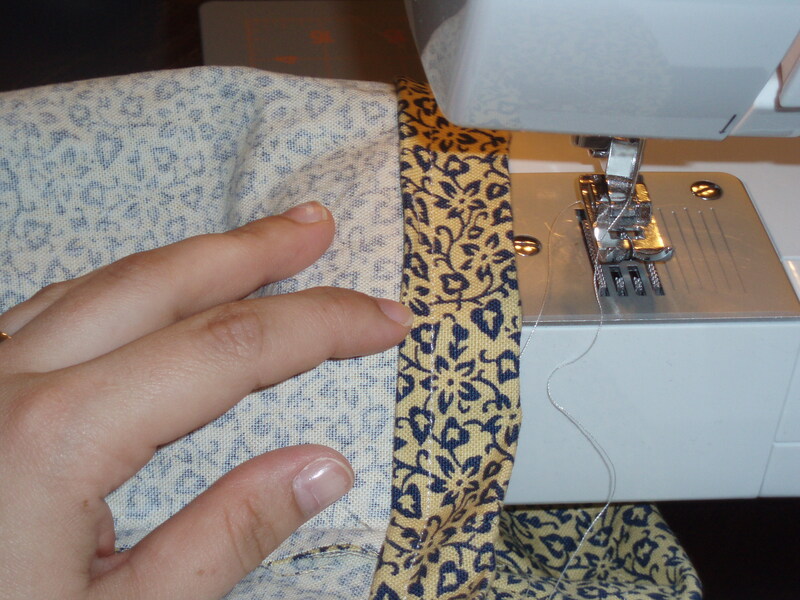 Now stitch it (leaving 1/4″ seam) down the side of the front, when you get to the bottom, leave your needle down – pick up the foot of the machine and pivot your work so you can sew across the bottom- put the foot back down, turn and line up all your fabric- clip the corners if necessary. Sew across the bottom. 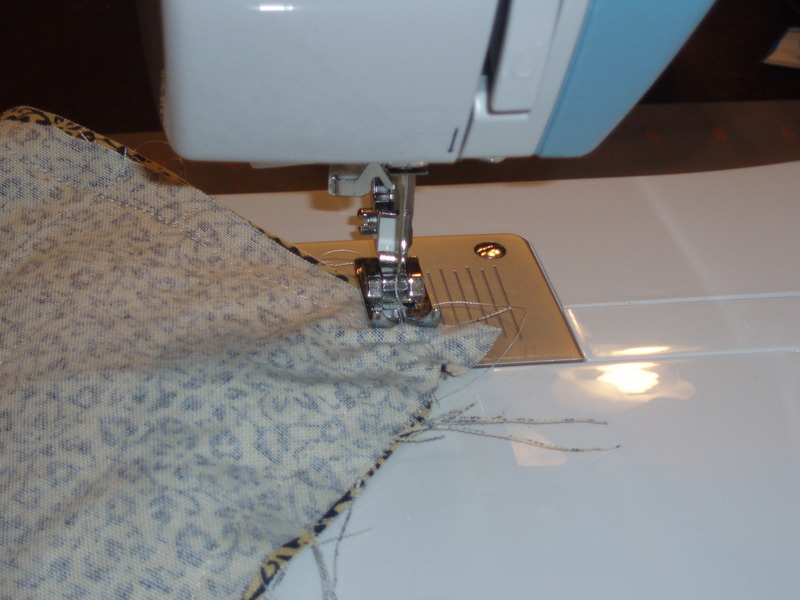 Leave the needle down, pivot, and sew back up the other side, clipping the corners if necessary. Now your side/bottom is attached to the front of the bag. Sew the back of the bag to the other side of the side/bottom doing the same thing. I always sew back over the ends of my straps to make sure they are really stuck on there good. 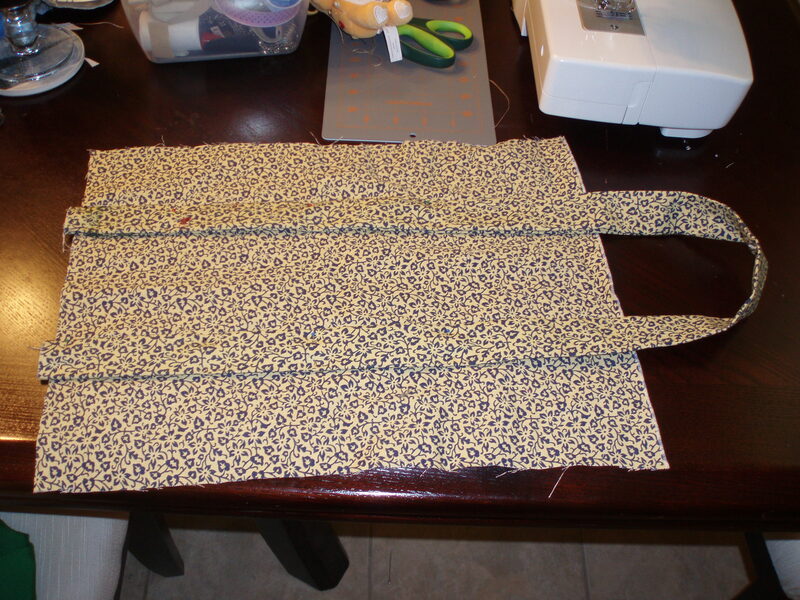 I also start on the same side when sewing the front and back onto the bottom, just in case there is a little extra fabric from the side/bottom left over. -I reinforce the corners of my bags. Just a quick little sew over the corner makes the bag much more durable! By now you can see that your bag is looking like a bag! -Now we hem the top! With the bag still inside out, take it to your ironing board. Ahh! More ironing! Make sure your straps are stuffed down inside the bag. Fold the top down, iron. Fold the edges under, iron. (Make sure you are folding it toward the inside of the bag, which is currently the outside. – See photo!) 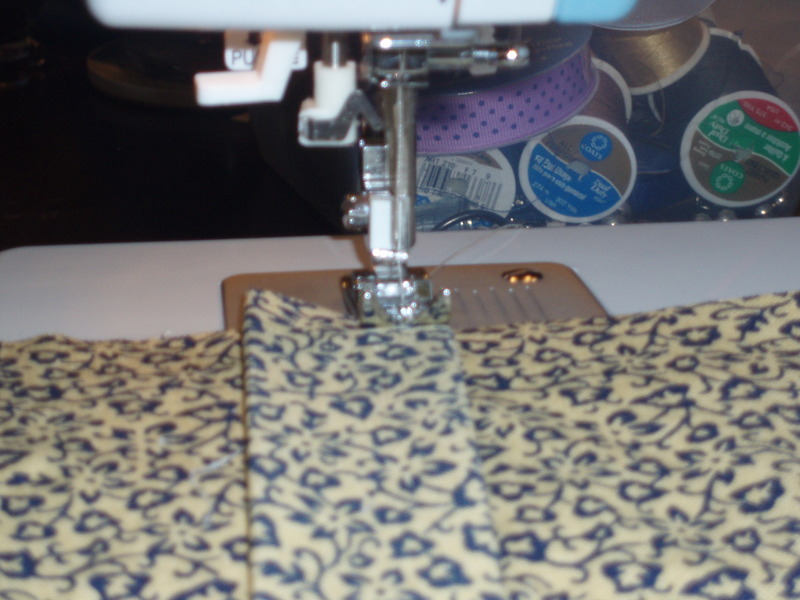 Place your foot right on the bottom edge of the bag and sew the top hem. -Flip your bag right side out! You are almost done! Now is when you finish your straps. 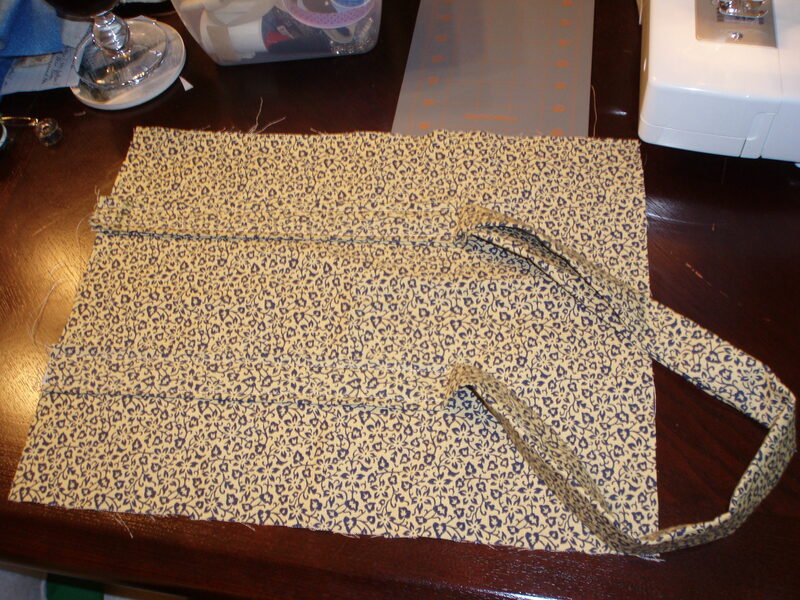 Line up your sewing machine with where you left off topstitching the straps up the front of the bag. Finish the topstiching. 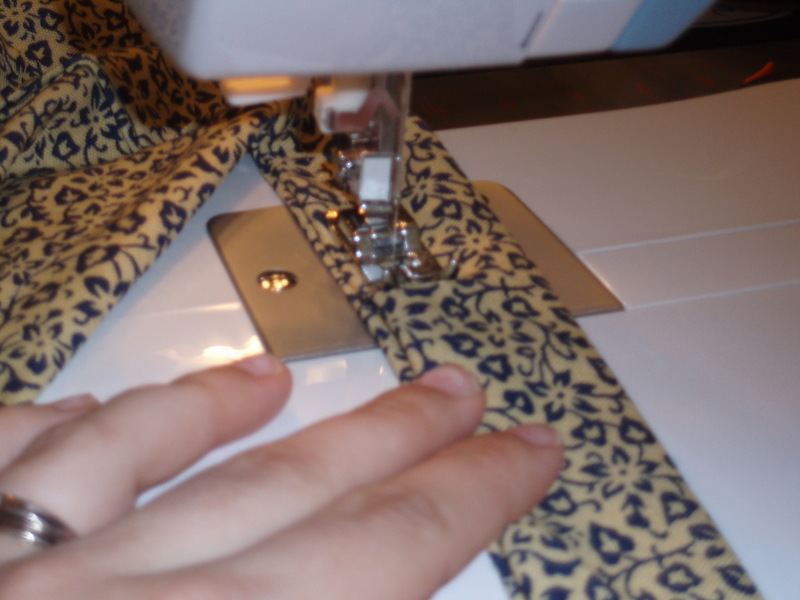 Don’t stop at the top, keep sewing up the side of the strap! Repeat for each side of the strap and each side of the bag! Now make plenty more so you have enough for your grocery shopping trips! I thought I might add this little tidbit. I went to the grocery store after posting this and took some of my reusable grocery bags with me. I wasn’t aware of it before, but Kroger, where I shop, gives you $0.03 off your total for every bag you bring in for your groceries! I only had a few things to get, so I only took 3 bags in. I got $0.09 off my total for providing my own bags! Pretty sweet deal! Next Article My Baby Girl Is 2! Thanks for the “how to.” I’ve been thinking of making some grocery bags myself and I appreciate not having to buy a pattern … because who really needs a pattern for rectangles? Directions are all you need. Great tut Linds! Thanks girl!